Salmo—The Salmon. Trutta—The Trout. Thymallus—The Grayling. Capito Seu Cephalus—The Chub. Salmonidæ—Smelts. Anguilla—The Eel. Various seu Phocinus—The Minnow. Cobitus Fluviatilis Barbatula—The Loach. I deem a very brief notice of the above varieties of fish sufficient,—they have been described over and over again by much abler pens than mine, and I advise all those who are desirous of minute details, as to their conformation and habits, to have recourse to one of the published Histories of British Fishes, indeed all the above fish and their varieties have been faithfully and naturally described in (I take it for granted) every angling book that has yet been published. As to Salmon, I need allude no further than observe (as every one knows that they are both ocean and river fish) that they afford, when plentiful, excellent sport to the angler, taking freely the Minnow, Worm and Fly, that they generally select the deepest pools of a river for their chief residence, but yet may be taken anywhere with the fly where there is three feet of water. They generally rise best about eleven o'clock in the forenoon, and three in the afternoon of a day. When there is a little wind stirring, if accompanied by rattling showers of hail or snow in the Spring, or heavy showers of rain in Summer, so much the more likely for sport. Salmon fishing in every respect is similar in the modus operandi, to that of Trout,—requiring not more, if so much skill, but more nerve and patience with, of course, much stronger rod and tackle, and larger flies, and if you try worms, two large lob worms well scoured, should be put on the same hook,—you also require a Gaff for large fish. The best Salmon Flies for the Tees (which is by no means a good Angling river for Salmon) are the Dragon and King's Fisher, to be bought at most tackle shops, and a fly deemed a great killer made with a bright scarlet body, and wings from the black feather of a turkey. The Trout almost every one knows, that the Trout is a delicious fish, beautiful and elegant in form and appearance. Trouts vary, being yellow, red, grey and white, the latter like Salmon, go into salt water. Trout spawn in the winter months, after which they become sickly and infested with a species of what may be denominated fresh water lice. In winter he keeps to the deep water; in spring and summer he delights in rapid streams, where, keeping his head up the water, he waits for his expected prey. There is no other fish that affords such good and universal sport, or that exercises the skill and ingenuity of the angler so much. The different modes by which to effect his capture are fully described under the different heads of fly trolling and bottom fishing. 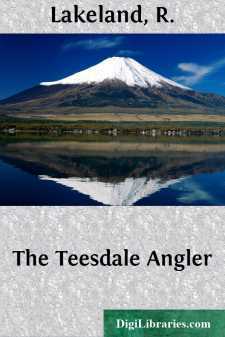 This fish (but seldom taken any great weight) abounds in the Tees and its tributary streams.